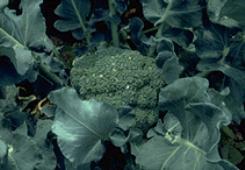 Broccoli can be divided into two broad classes: single-season and over-wintering. The overwintering (or “spring broccoli”) types are for just that: planting in the fall and cropping in early spring. (Many purple types are for overwintering.) Because we have generous freezer capacity, we see no virtue in the overwintering types, which were developed to provide an early fresh green. Just be sure that you don’t inadvertently plant an overwintering type when trying for a regular-season broccoli or you’ll get poor or no crops. The “standard” season broccolis can be further subdivided, if only roughly, into two other classes. The first produces chiefly a main head and few or no side shoots; the second, often called “sprouting broccoli”, produces a smaller main head and (or but) after that is taken, a considerable quantity of side shoots that keep on coming for some time. The division is rough because even the mainhead types normally produce some side shoots, and even the long-production types have some degree of main head. Some sources, all anecdotal, prefer this or that variety, but others assert that all, when grown properly, taste pretty much alike. Sigh. Though the home gardener cannot save seed of any brassica, owing to the immense likelihood of disease (growing brassica seed is a difficult process, and all commercial seed is eventually inspected for infection before sale), we nevertheless believe in using open-pollinated types only, to encourage and sustain the maintenance of a sound gene pool for this and all crops. There are only so many OP broccoli types readily available, so even the complete list is short, but we can further trim it by climate considerations. We will repeat here what we now say about all Brassicas. For a long time, we made the mistake many amateur Brassica growers make, that of trying to race against summer with cool-weather crops. Even with fairly early plantings, if the crops don’t mature very quickly, the weather gets warm then hot, and your broccoli (or other Brassica) crop is largely or wholly shot. Our cultivar recommendation is the open-pollinated type Thompson; this type was developed by the reknowned plant breeder Tim Peters. Then there is Piracicaba: a newcomer, said to resemble a cross between heading broccoli and broccoli raab (see farther below), also fairly early (56 days). The Washington Post garden writer certainly liked it, and so apparently do a lot of other folks. Its chief virtue is that, despite a rather small main head (circa ½ cup’s worth), it produces great quantities of larger-than-usual side shoots, which are really its purpose. It provides steady amounts of broccoli for a long season (it seems to be unusually heat tolerant for a broccoli, which makes sense as it was developed in Brazil) and is actually well suited for spring planting for harvest right on into early winter. We really must try some soon (though not this season). 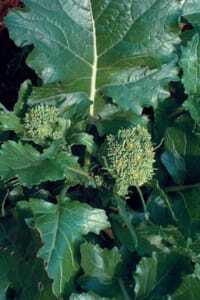 There is a related vegetable—actually a turnip relative—called broccoli raab (also called by many other names—raab, rapa, rapini, rapine, rappone, turnip broccoli, spring broccoli, taitcat, Italian turnip, Italian mustard), which is a broccoli cousin whose edible parts are the leaves and stalk rather than florets—it’s quite bitter and is either an acquired taste or useful as a very occasional novelty. We’ve done it, and, though we both have some taste for bitters, have decided that this is one we can do without. For those who do like it, here is a bit more. The primary distinction in cultivars is between so-called “spring” and “fall” types: the fall types are really for overwintering, with the much earlier spring types, such as “Sessantina”, being what’s wanted for our climate (the fall types, spring-planted, bolt too easily). Most catalogues offer just a generic raab, but specialists in Italian vegetables have scads of named cultivars. Even so, exact and reliable cultivar information is hard to come by; we make no recommendation here. Other recent curiosities, such as “broccoflower” (a broccoli/cauliflower cross) and Romanesco, which looks like the same idea, are of zero interest to us: we have store-bought some, and even grown the Romanesco (some years ago, elsewhere), and found them to be much like the once-touted potato/tomato combination plant—clever, but boring to the taste. First, and always with any brassica crop: Remember to rotate your crops! Planting brassicas, of any kinds, in the same ground more often than once every four years runs the risk of clubroot infestation—and once you get that, the ground is useless for up to a decade. Don’t take needless chances, even with “catch crops” of radishes. A lot of sources insist that broccoli should be started indoors as seedlings. But they are talking about spring-planted broccoli, which, as we said above, seems a useless fight against nature. If we are summer-planting for late-autumn harvest, for us the seeds will go in the ground around mid-July, which is scarcely a time when one worries about poor l’il seedlings getting frosted down. So, obviously, we direct-sow. For our exact climate, we will be seeding on July 15th. The nice thing about fall harvest is that we don’t need to be too exact about dates, because the plants can go pretty deep into autumn and early winter. Umpqua is listed as 60 days, which means harvest should be able to start in mid-September; but we can keep going on till at least early October, and likely a lot later. What a change from spring planting! Broccoli raab is usually about the same growth span as ordinary broccoli (around 60 days), but there are some cultivars that seedsmen claim are ready in only 40 days. We’d treat it just like broccoli for growing, but if you get one of those very early types, think about seeding it a little later, say toward the end of July. Plant seed ¼ to ½ inch deep. In a deep-dug bed, space the plants at about 16" (and as they grow in, they will for a leaf canopy sometimes called a “living mulch” of shade). It is wise to use several seeds at each spot, then thin to the strongest when they emerge. A soil pH of 6.5 or higher is wanted; a soil pH of over 6.8 will help minimize clubroot risks, and a pH up to 7.5 is tolerable, though best yields come in at about 6.5 to 6.8. (Lime, preferably hydrated—as sold in practically any garden shop or decent hardware store—can be used to raise soil pH, but remember that it’s harder to lower pH than to raise it, so don’t get careless: make sure you do your calculations carefully, twice, before applying any lime.) Wood-fire ashes can also be used in place of lime; if you have some, do your homework on quantities to use. Side-dress with nitrogen fertilizer when the plants are about half-grown. Be sure to provide ample soil moisture (duh—water well), most especially as the heads are developing. An organic mulch helps keep soils cool and moist and suppress weed growth—or, if you deep-bed garden, the plant leaves will form a “living mulch” over the growing area. Hand-pull or use shallow cultivation if additional weed control becomes necessary. Removing the central head stimulates the side shoots to develop for later pickings. These side shoots grow from the axils of the lower leaves; you usually can continue to harvest plentiful broccoli shoots for several weeks after cutting the main head. You can harvest broccoli raab all at once or gradually. For “all at once” harvest, plants are ready for harvest when they reach a height of 10-15 inches; cut them at ground level, or—if the stem is hard at its base—wherever the stem tissue ceases to be tough and becomes succulent (with luck, a second or even third cutting may be possible). Alternatively, you can keep the young leaves, flower buds, and stems lightly harvested over a continuous period of two to four weeks—cut the small flower heads before the flower buds open (these flower heads usually average about 1 to 1½ inches in diameter). Vegetable Cultivar Descriptions for North America: Broccoli - very helpful for distinguishing hybrid from OP cultivars. Broccoli is a member of the Brassica family, which also includes cauliflower (a close relative), Brussels sprouts, kale, rutabagas, turnips, kohlrabi, radishes, and various lesser crops like seakale and the true cresses (notably watercress). Also, some people seem to have a genetic makeup that makes broccoli (and related plants) taste excessively bitter to them, which is why people can argue about something without realizing it may be a quite different experience for each of them. The people we know as the Etruscans, who came from what is now Turkey, seem to have begun the known cultivation of broccoli—or at least its direct predecessor—almost three thousand years ago; its use eventually spread throughout the Eastern mediterranean area. In the 8th century B.C., the Etruscans began migrating to what is now Italy, and they brought broccoli with them, especially to what is now Tuscany. The Romans were at once taken with broccoli. Pliny the Elder tells us that the Romans grew and enjoyed broccoli during the first century A.D. The vegetable became a standard favorite in Rome, where the variety called Calabrese—the most common type in the U.S. today—was developed. (Before the Calabrese variety was cultivated, most Romans ate purple sprouting broccoli, a type also still in wide use today.) Apicius, a Roman cookbook author, prepared broccoli by first boiling it and then bruising it “with a mixture of cumin and coriander seeds, chopped onion plus a few drops of oil and sun-made wine”; it was also commonly served with a variety of cream sauces, some cooked with wine, others flavored with herbs. Catherine de Medici of Tuscany is said to have first introduced broccoli to France when she went there as the new wife of Henri II in 1533 (she brought an army of chefs and new vegetables as well, and that is said to have been the beginning of France’s rise to culinary significance—the Italians still say they taught the French everything they know about cooking, which is probably an exaggeration, though not a huge one). By 1724, a British gardening writer referred to broccoli as a stranger in England, and called it “sprout colli-flower” or “Italian asparagus.” When broccoli did arrive in England, in the early 18th century, no one spread the welcome mat. At that time, neither the French nor the English much cared for this vegetable. Thomas Jefferson was an avid gardener and collector of seeds and plants of fruits and vegetables newly arriving in the United States. He recorded planting broccoli—along with radishes, lettuce, and cauliflower—in 1767. But as early as 1775, broccoli was described in A Treatise on Gardening by a Citizen of Virginia, by John Randolph, who wrote, “The stems will eat like Asparagus, and the heads like Cauliflower.” Despite this encouraging description, broccoli was not much taken up in the U.S. (except by, a little later, Italian immigrants, many of whom who grew and ate it). Broccoli popularity in the U.S. awaited the D’Arrigo brothers, Stephano and Andrea, immigrants from Messina, Italy; the brothers began with some trial plantings in California in 1922, shipping a few crates to Boston, where they somehow were well received. The time must have been right, for the brothers’ enterprise ballooned; they grew, they advertised by on the then-new radio, and by the 1930s broccoli was an established favorite in the land (many thinking it some newly developed vegetable). Today, it is perhaps the number one vegetable in the U.S. (despite a few persons’ curious distaste for it). You loaded this page on Friday, 19 April 2019, at 16:56 EDT. It was last modified on Monday, 28 January 2019, at 21:47 EST.